There are a lot of options in the Bay Area for snagging mushrooms more exciting than cremini. Berkeley Bowl, Rainbow Grocery, Far West Fungi (in the Ferry building), to name a few, and one place that we discovered recently, Monterey Market. They've got a huge selection of wild mushrooms, and a even a few containers of black truffles from Oregon, in just the right size so as to be affordable. 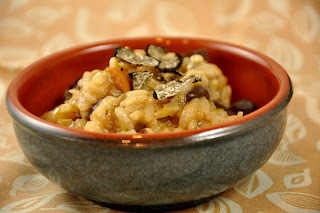 We stocked up on shiitake and hedgehog mushrooms, and also selected a small black truffle to make a simple risotto. For a little extra creaminess, try stirring in a small amount of mild cheese such as fontina. Enjoy your umami. 1. In a medium sized pot saute leeks in olive oil for about 6-8 minutes or until just tender. Add mushrooms, and saute for another 5 minutes, adding a little extra olive oil or butter if needed. 2. Add the rice and stir for about one minute, then add the white wine, stirring until absorbed. 3. Begin adding the stock to the rice mixture a little at a time, stirring occasionally, until the liquid is absorbed. Continue adding until all the stock is used. This should take about 20-25 minutes on low heat. 4. Next add salt and pepper, then stir in a little cheese if desired. Dish into bowls and top with very thin shavings of black truffle. If you don't have a truffle slicer/shaver, use a very sharp pairing knife. And if you don't have truffles, try drizzling a little truffle oil over the risotto before serving. Or you can go all out and use both. Thanks for this -great photos too!